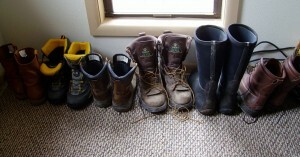 I don’t know what it is about men and their boots. They buy them, wear them, wear them out and stack them up. Or put them in a closet, or line them on the back porch. T.h.r.o.w. t.h.e.m a.w.a.y is not in the plan. How do I know? I just do. 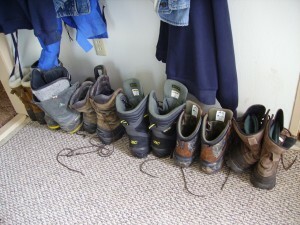 I’m a counter so I know for sure there are twenty seven boots and shoes stacked around the porch and bedroom. 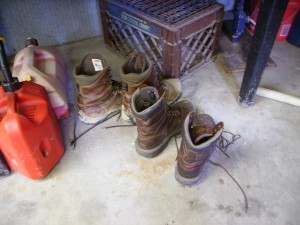 And I also know there is at least one more pair because hubby is out riding Jake in the mountains today with Stephen. And I saw he had on cowboy boots and spurs. And another pair he does cement in. A pair of rubber galoshes for wet days. I couldn’t find them to take a picture but I know they exist. And these I found in the garage. My daughters probably have one hundred shoes between the two of them. I’m not sure what it’s all about. I just know that I have hundreds of crafts I’ll never use and they have hundreds of shoes. I guess she gets it honestly. Me? I’d rather have wood. 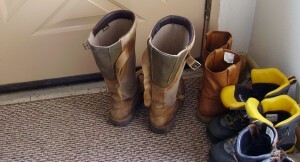 Dad’s boots really drive me crazy so you’re not alone in that, but I just wanted you to know that Jake the horse died when I was 8. I think that he has three and a half horses and their names are Duke, Blaze, and Harley. The half is Dess who they haven’t been able to catch for five years . . . anyway . . . Have a lovely day.